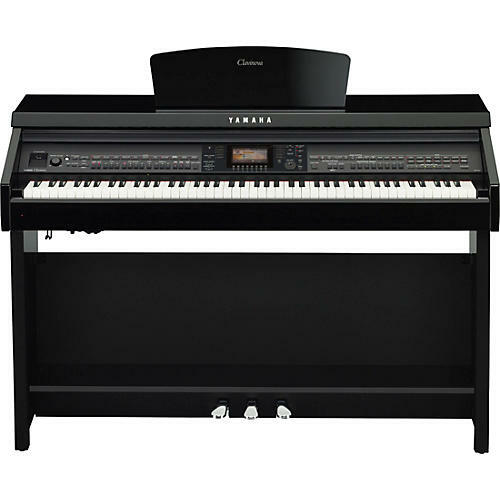 One of the most features-rich instruments in the Clavinova line. Yamaha CFX and Bösendorfer Imperial piano samples bring two of the worlds finest and most prominent concert grand pianos to your fingertips. Its GH3X (Graded Hammer 3X) keyboard action with Synthetic Ivory Keytops features three sensors and an escapement mechanism, creating a response and feel that is very much like that of a grand piano. Piano Room with Session Mode brings you back to the basics. Select a piano and choose the type of room you're in, and even invite a small ensemble along to play with you. USB audio recording and playback captures or plays back performances on a USB drive. Follow Lights-orchestrated song files use Guide Lamps that illuminate over the right keys to teach you classic melodies at any tempo. You Are the Artist series software gives you the in-band experience to perform music by superstar artists like Adele, Coldplay and Taylor Swift! Accompaniment Styles add a "backing band" to your performances while you remain in complete control of chord changes and arrangements. USA Edition adds valuable content to your Clavinova CVP purchased in the USA, including Voices, Styles, Songs, Style Guides and much more. Virtual Resonance Modeling (VRM) allows for vivid and richly-varied expression to reflect the limitless number of factors that create the sound of a concert grand piano. Music Finder contains a list of song titles that when selected sets up your instrument with an appropriate Style and Voices, saving you time searching so you can start playing that song right away.From the outstanding grand piano touch of the GH3X (Graded Hammer 3X) keyboard with escapement and Synthetic Ivory keytops to the intuitive design and integration with iPad, the Clavinova CVP-701 digital piano puts you in touch with your inner musician. BC108BK bench, 50 Greats for the Piano Music Book,Power Cable 1-15P to C7 Polarized (2 Prong), User Manual, CVP700 Series Entertainment Pack & Starter Kit are all included. Rich in style, sound, accompaniment features, effects, connectivity and more. A leading home piano. Order soon.